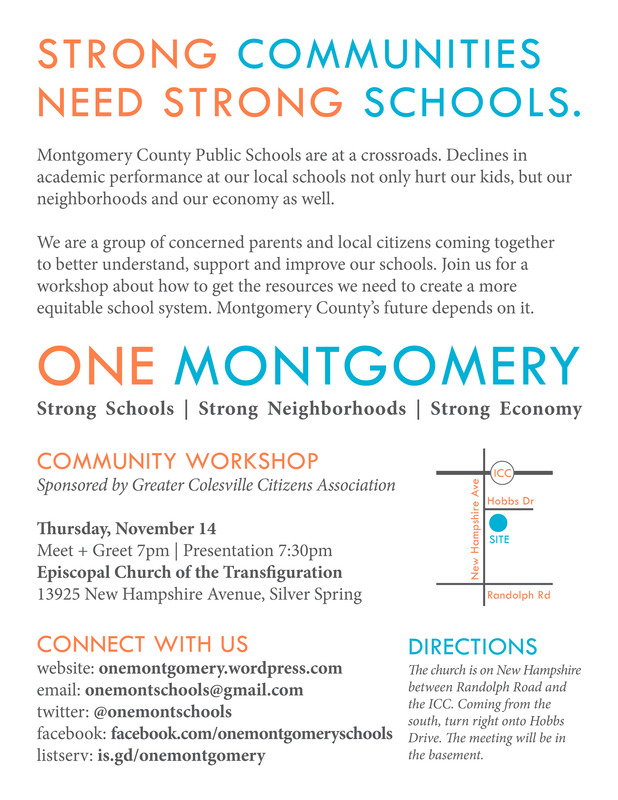 One Montgomery is ready to start a conversation about how to support and improve Montgomery County Public Schools so that every student in every school has the resources they need to succeed. Join us for a community workshop on Thursday, November 14 at 7pm at the Episcopal Church of the Transfiguration, located at 13925 New Hampshire Avenue in Colesville. This event is sponsored by the Greater Colesville Citizens Association. We’ll have a meet-and-greet with refreshments at 7pm before calling the meeting to order at 7:30. There will be a short presentation about the issues facing Montgomery County schools, especially those in the Northeast and Downcounty consortia, followed by breakout sessions where we can gather ideas for how promote school equity. For more information, email us at onemontschools@gmail.com. Join us for a community workshop November 14. Here’s a printable copy of the flyer. We look forward to seeing you there!